Please bear with us while we construct our website. Any informationon that we may provide; requested by members in good standing is available either online or by snail mail. Please tell us how we may help you. Search Service is available. 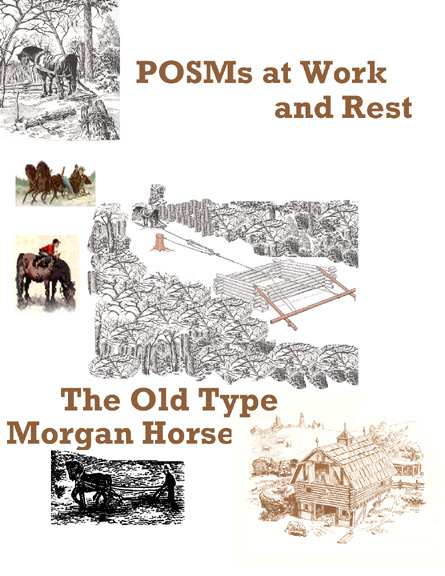 The POSM Horse Registry is a tool dedicated to members in good standing of A POSM HA to assist you in finding particular lines of the old type Morgan horse acceptable to the POSM Horse Registry as of POSM type for all around useful, responsible primary work on the small family farm/homestead, use in the woods or on the road. Type denotes not only a look or appearance, but also a spirit or being. An all around horse could have many appearances. As it turns out the horse that has the greatest sum of the parts that make up the all around general use horse is an ancient horse; the old type Morgan horse. He has a spirit that can be duplicated in a pinto, palamino, appaloosa, buckskin, etc., but why do so just to be tinkering? If he ain't broken don't "fix" him! Taking this wonderful little horse and making another horse has been done. Please stop and smell the roses. This is the horse. He doesn't need to be anything more than what he is. Let him be. To get his sensible mind, willingness to please, gentle nature, longevity, stamina, heart, power, general all around usefulness, don't change him. He is black, brown, bay and chestnut. White is a defect. Folks who used these horses everyday for livelihood at hard physical work to make their bread found these horses to be tops. They always brought the highest prices when a horse was chosen for what he could do. Every time you change something you get further from the original until the original is lost. Use him or leave him. Type varies from style. Style is the whim of a person based on no function, but what a person likes. Similar to the style of a hat; here today and gone tomorrow. Stay the course breed something proven and the result of use when it counted. Please note we used the word "style" in the abbreviation for the ancient old type Morgan horse we specify and limit to the POSM Horse TM. It stands for Phillips' Old Style Morgan Horse. We can assure you he is a type and not a style. His type is general all around useful on the small family farm/homestead or in the wood lot or on the road. He has been proven in this regard when it was a merit to work hard by the sweat of one's brow. Your life, family and community used the POSMs and all benefited with God's blessing. Of course there is acceptable variation. But we breed to type. He should not only look POSM. He should be POSM. We of the A POSM HA have agreed upon acceptable type and use. We do not agree that because a good horse was bred to a post, the post is POSM type unless the individual is. We seek to recognize those POSMs that best characterize POSM type and promote them by a star system. It is not intended to be a status symbol, although some will use it as such. But, it is a tool to give breeders a direction to look for POSM type they want to breed. Remember, he is not only appearance, but also being. What is his mind, his attitude, his willingness to work, etc.? What lines of POSMs carry these traits? It is the skill of the breeder to choose the right foundation stock for their contribution to the POSM Legacy. We want to leave useful horses for primary work on small family farms/ homesteads, use in wood lots or on the roads. If God blesses our efforts, we will leave posterity a POSM Horse to take them into the future, should the Lord's return allow it. We will build communities, neighborhoods, lives for people; using animals in partnership responsibly and humanely to feed, clothe, house, fertilize, transport, power small regional and more cyclic craft agriculture and its associated services. We have an opportunity to use advances of today wisely and choose ways of life better suited to wholesome living as God provides through His love for neighbor and nature. Let's do it. Written instruction and photos of type to follow. To be used in responsible primary work to feed, shelter, transport, power, provide manure, provide replacements, etc. and all the associated necessities required in simple living. You know, where you don't send your kids off to be raised by strangers? But, where people work together, live together, grow and die together. Where folks don't go to a gym for exercise, but in the common everyday labor of life you get all the daily exercise one needs. Not factory farming and its associated living, but simple living as concerved by God with neighbor and nature in mind. Let's seek not to trade one factory system for another. Let's not make the farm devoid of life; sterile and analytical. A different way of life. Life at God's Nature's Pace. Wouldn't it be something to owe nothing? Own or work a small place and just feed your family, stock, barter with neighbors for what you don't produce or sell a small amount of your produce to pay taxes, etc.. Do your kids need to go to college? Did you? Why are you reading this if you did? It maybe God telling you something. Perhaps connection. It's family, place; life the way some were intended to live. If your kids are talented enough and want to go to college, let them get scholarships. You give them love ( not things or a family of strangers making up neighborhoods, communities or a nation of the same.). The best is not things. We are in the world; not of it. Please understand, this does not save you, but it may prove you. Only Jesus saves and He does that where you are. But, for some, just maybe this is truth. Once a breeder comes to understand Type, you then understand that these horses are not everywhere and you become like many of us. You only want them to go to breeders that are going to promote type or in other words to A POSM Horse members. Those dedicated to seeing them bred to promote, perpetuate for responsible primary work purposed for small family farms/homesteads, use on the roads or in the woods. One understands the danger of primary work, but in perspective it is a far more responsible and sensible purpose than a horses life or our lives spent for show or our pleasure or our sport or our leisure. Responsible primary work feeds families, horses, neighborhoods and creates a place for regional economy and usefulness. It provides purposeful exercise, fertilizer, replacements, transportation, traction power, a dependent human animal working partnership as we all depend on God. POSM Type exists in different families of horses. By the time one learns a breeders prefix, the offspring or sold and that horses offspring are named under the new owners prefix if registered. If not registered, they are lost to prospective buyers or breeders. Attempts to study and trace bloodlines of outstanding POSM characteristics are lost all together. So our job of finding POSMs is difficult. In addition to this problem, we must deal with the masses of people who have the money, but are only interested in consumerism. They buy outstanding stallions and geld them because they want to show or enjoy them for pleasure or sport or leisure. Many places today do not allow stallions. Or outstanding POSM type is lost to consumers who want them for children with no thought of replacing them for posterity. When Susie or Bobby out grows the POSM, he is sold. Sometimes without papers or tractability or even worse to the "killers". So to our members we offer a Search Service. If you tell us, after viewing the different horses of acceptable POSM Horse type (See Our Photos of Type) and choosing an acceptable horse you would like to see perpetuated, we will assist you in your search of descendant or siblings descendants of that POSM type line. We search pedigree. We also can make known to you on request horses of any acceptable POSM type known to be for sale. We also promote POSMs of outstanding type to our membership for breeding purposes. Such an animal does not have to be owned by an A POSM HA member or be in sympathy to our cause. Members, however, agree to only breed any Registered POSM Horse mare to approved POSM Horse type. Why? Because a POSM stallion breeds and the mare is gone and the foal is born somewhere else in most cases.. An approved POSM Mare bred to an unapproved stallion delivers an unapproved offspring that remains by the mare's side until weaned. This is just enough time for you to fall in love with a baby pinto, appaloosa, Arab, etc.. We not only lose POSMs but lose dedicated POSM breeders.